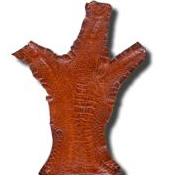 The name for leather made from chicken skin is Poulard. Yeah, yeah, I know. I was surprised myself when I heard of this the first time but, yes there are fashionable items made from chicken skin. Strange at first, but true all the same. Anyway, chicken skin is making quiet a commotion in some areas of East Asia. It may or may not make it's way to the runway of famous fashion shows this season but it is guaranteed exotic. All the fuss was because it is unheard of (obviously). The other is due to the immagination it creates in the mind. Handbags made from the skin on chicken necks may be a long shot but, well, you never know. A little trivia here. Do you know that the leather quality of chicken skin is soft? The heaviest chicken is 22 lbs. (10 kg approx.) belonged to Grant Sullens, West Point, California, USA. The breed is a White Sully. It has a very mean temper as it has been recorded to kill two cats and wounded a dog. The oldest chicken is a hen by the name of Matilda, age 14 years, is a breed of Old English Red Pyle. The owners, Keith & Donna Parton think that the contributing factor to the longivity is that the hen is pampered and does not lay eggs. Where it lives in the wild? Red Jungle Fowl (Gallus gallus philippensis) is found in India through Southeast Asia onwards to Southern China with one race in the Philippines (reported sightings in Samar island, Leyte province, Philippines). Anywhere where there is a need for eggs and chicken meat! Seriously, all over the world. it was domesticated 5,000 years ago. No. Unless you happen to freighten the chicken at it pecks at your face, you may loose one of your eyes. Not really. The chicken will flee when it thinks it is threatened. Sure, chickens pecking the toes, beating people with their wings and such like. We couldn't get the yearly global statistics for this. Seriously? No global data available. Direct fatalities are not available. Chickens live together as a flock. They incubation of eggs and raise their young together (communal approach). Individual chickens in a flock will dominate others, establishing a "pecking order", with dominant individuals having priority for access to food and nesting locations. Removing hens or roosters from a flock causes a temporary disruption to this social order until a new pecking order is established. Chickens will eat small seeds, herbs and leaves, grubs, insects and even small mammals like mice, if they can get them. 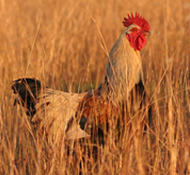 Chickens often scratch at the soil to get at adult insects and larva or seed. 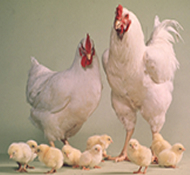 Chickens in farms are typically fed commercially prepared feed that includes a protein source as well as grains. Farmed in various ways, depending on the end-product; poultry meat or eggs. Some are allowed to roam in a fenced area while some are kept in cages. Chicken farms can handle as much as 100,000 chickens! This depends on the desired product: meat for frying or meat for frying. Chickens raised for meat are called broilers. Cornish Cross hybrids are butchered as early as 8 weeks for fryers and 12 weeks for roasting birds. Egg layers are derived from the Leghorn variety (White Leghorn for example). The egg laying rate is 300 eggs per year. Leghorns start laying eggs at about 20 weeks of age and they weigh about 3 lbs (1.36kg). First, you take the skin off. This happens at the butchering/packaging plant. Then it is salted to be preserved, to be processed at the tannery. It stops bacteria from decomposing the skin, too. There is the option to bring it to the tannery fresh. It is cleaned up, so both sides may in fact be shaved, so it might take the hair or feathers off one side and the fat and connective tissue off the other side and then it goes through a couple of processes that prepare it for receiving the tanning chemicals. The tanning chemicals are bonded on to the skin by changing the Ph level (level of acidity). Then it is ready for dyeing and finishing. Skin from the chicken legs are taken, especially the upper part of the legs. They go through the same process. When correctly processed, it's like any other leather. It is soft to use for gloves, you could use it for steering wheel covers, or covers for mobile phones and so on. It has got what they call a grain and for most skins that’s what you pay for. 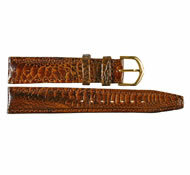 Chicken leather has a pattern of the grain. The feather follicles are distributed in feather tracts and that is what we mean the "grain".